The Marble Zone boss is the second encounter in the original Sonic the Hedgehog against the nefarious Dr. Eggman. Keeping in line with the simple yet sometimes deceivingly challenging bosses that pepper the first game, the Eggmobile in which the mad genius pilot is outfitted with a small attachment to the bottom that drops fireballs onto the ground below. Unable to scroll out of the boss arena, Sonic the Hedgehog must stand on either side of the field, the now-familiar marble blocks of the zone interrupted by an equally-familiar bed of lava that will snag away a life if Sonic lands on it without having any of his trusted rings upon his person. It is these left and right platforms that Sonic must navigate to while once again fighting Dr. Eggman. Appearing initially from the right side of the screen, the crazed doctor hovers over the solid ground for a moment before moving to the other side, fireballs from the lava pit in the middle shooting upwards. 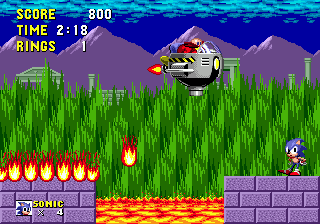 Once on the left, Eggman proceeds to fire a single fireball towards the ground, which soon spreads, and causing the entire platform to be covered in the potentially lethal fire. However, this is only temporally, the fireballs eventually falling to either side and the ground becoming safe for Sonic to trend upon once more. After his initial attack, Dr. Eggman will continue moving across the screen, each time firing the same attack on either side until Sonic is able to defeat him. The best time to attack Eggman is while he is in motion, each hit causing Eggman to momentarily freeze his movements as he recovers, a startled expression crossing his face. If a player begins the battle with Sonic on the right side of the field, there is plenty of time to land hits on the boss before he begins his attack, an expert player able to finish off the fight with relative ease. Otherwise, it is best to wait until Eggman begins to move across the screen, jumping to attack with the classic spin attack all the while avoiding the fireballs that jump up in the middle of the screen. Though Sonic can still hit the villain of the game when he is directly overhead, great caution and timing must come into play, Sonic needing to jump across the screen or else succumb to Eggman's attack. After eight hits, the Eggmobile is put out of commission, the red-faced doctor fleeing to prepare for his next fight. With a simple jog to the right, Sonic must jump upon the capsule and free the various Rickys and Rockys within before heading off to the Spring Yard Zone. This page was last edited on 8 April 2018, at 08:56.